NEW CARPET AND POOL TABLE IN GAME ROOM!!! Conveniently located to downtown Gatlinburg. Beautiful newer 5 bedroom (2 Kings,3 Queens) 3 bath chalet with log siding. 3 Levels. Full bath on each level.WIRELESS INTERNET. Main level has a living area with sleeper sofa and gas fireplace, 32 inch flat screen TV, DVD/VCR and movies. Dining area with table and chairs for 10. Kitchen area with microwave, dish washer, 2 coffee makers and a table and chairs. The main level also includes King size bed and cable TV. Upper level includes 2 bedrooms (King, Queen) each with cable TV. Lower level has a game room with pool table, sleeper sofa and CD player.Video Arcade game with 8 different games including pac man, ms pacman, frogger, donkey kong, galaga, and more. 2 Bedrooms (Queen)with Cable TV. Washer/Dryer. 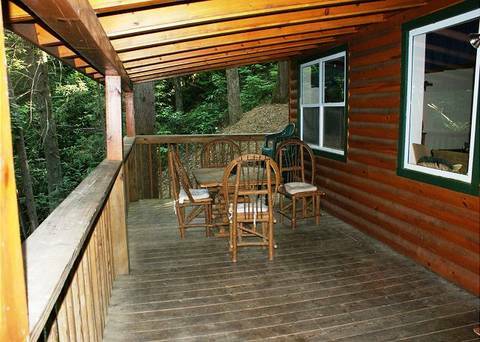 Enjoy the covered deck in a lovely private wooded setting with hot tub, charcoal grill and deck furniture. Front porch with rocking chairs to enjoy the lovely mountain view. Approximately 1 mile from downtown Gatlinburg. Excellent chalet for families.